A look into a Halloween display on the street. The Clement Street shopping district is so distinct, it's almost like a sovereign nation of consumer trade. However just outside of its reach, the first three blocks of Clement Street- including a wraparound onto Arguello Blvd- are free from its grasp. Boutiques on this independent stretch include lovely collectibles, beautiful fabrics, exotic flowers and custom made handbags. These gems include talented newcomers opening right next to chic shops established in decades past. 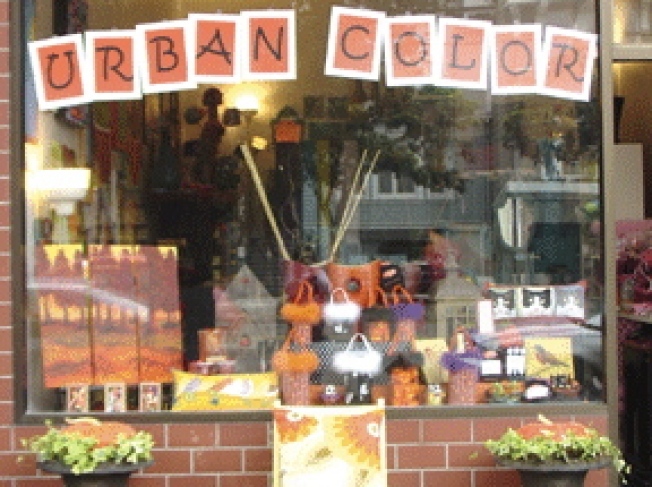 One of the been-around-a-while stores the newbies can learn from is Urban Color. Owner-artist Kendra Lock greets each customer as a guest with a cheery hello and a genuine welcome. Once inside, the choice of merchandise is almost endless. A talented contributor to the presentation, Kendra is an encyclopedia of information about the designers, contents, and origin of every item she sells. Clever wall art makes up a big chunk of the items she has to offer, with themes including vibrant fruit, distinctive vegetables and captivating city sights. Plump, adorable-yet-sophisticated pillows add another dimension of whimsy to the mix. Not to be missed is The Cat Face motif pillow collection for sale in a multitude of color combos- they are an ideal present for every feline fan on your list. Pep up a t-shirt and jean outfit with one of the funky-fun wristwatches on display next to boa trimmed polka dot tote bags, which are perfect for organizing a ho-hum office area. If ingenious gift wrapping is in order, Urban Color provides a variety of choices from elegant to playful. The bold bursts of color in each nook and cranny, on all the walls, stacked on every available shelf and fanned out on tabletops throughout the shop add bright-light to the collection of curio. This perky shop combines all things that make life ‘just a bowl of cherries’ and a visit is definitely an entertaining experience. Lesson learned at Urban Color: surround yourself with things that make you smile and enjoy life.